The wildfire near Yosemite National Park is 20 percent contained, while more than 4,000 firefighters work towards quelling the huge blaze altogether. NBC's Tom Costello reports. A California wildfire that has scorched an area nearly as large as New York City near Yosemite National Park was 20 percent contained Tuesday, officials said. But the raging blaze was expected to move farther into the park and threaten a reservoir that provides most of San Francisco's water. The so-called Rim Fire, has charred 179,480 acres, or about 280 square miles, making it California's seventh largest fire in state history, according to the state's Department of Forestry and Fire Protection. It threatens 4,500 structures as well as the power and water utilities for San Francisco, roughly 200 miles to the west. The flames also loomed over towering sequoias that are among the largest and oldest living things on the planet. The iconic trees can withstand fire, but brutal conditions — including harsh winds and thick brush — have prompted park employees to take extra precautions in the Tuolumne and Merced groves, according to the Associated Press. "All of the plants and trees in Yosemite are important, but the giant sequoias are incredibly important both for what they are and as symbols of the National Park System," park spokesman Scott Gediman told the AP. California Gov. Jerry Brown says he'll ensure his state as the resources available to deal with the state's massive wildfire. Though the fire remains in a remote wilderness area of Yosemite National Park, it has burned 22,000 acres inside the protected area. Wildlife has been seen on the move, including a mother bear and her cub. On Sunday, the fire had moved to within 2 miles of Yosemite's Hetch Hetchy Reservoir on the Tuolumne River, which serves 85 percent of San Francisco with water, according to San Francisco Public Utilities Commission spokesman Tyrone Jue. Ash fell on the surface of the reservoir on Monday, but water samples were still testing clean by late afternoon, Reuters reported. 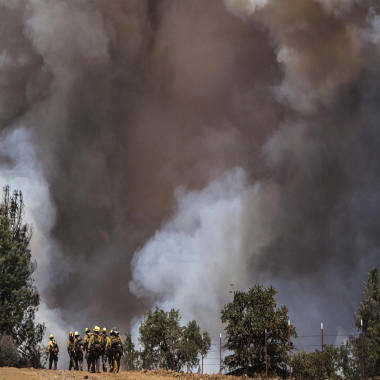 Tuesday's weather was predicted to remain hot, with temperatures in the high 80s and low 90s and winds of 10 to 15 mph, U.S. Forest Service spokesman Trevor Augustino told Reuters. Firefighters had hoped to advance on the flames Monday, but strong winds threatened to push the blaze closer to Tuolumne City and nearby communities. Mandatory evacuations were ordered south of state Highway 120 and north of Old Yosemite Road. "I have incredible faith in the firefighters," Sarah Whitney, of Tuolumne City, told NBC Bay Area on Tuesday. "They're walking around in their tactical uniforms and dumping retardant, . . . all that work, it's amazing." A group of elite firefighters, Strike Team 2276-Alpha from San Mateo County, was tucked into the trees Monday to protect the town of Tuolumne in case the blaze came over the hill. "It is dangerous," said strike team commander Ron Levezzo. "We had 19 firefighters, hotshots killed in Arizona. Fire is unpredictable when it gets up into the treetops." 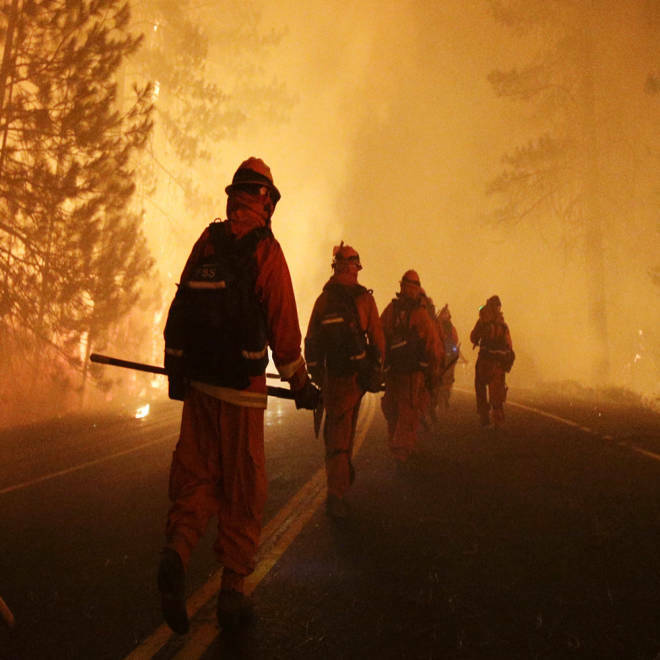 The Rim Fire has scorched almost 134,000 acres near Yosemite National Park. Almost 3,700 firefighters have been drafted in to tackle the fire that continues to threaten thousands of rural homes surrounding the popular tourist destination. The fire has already destroyed 23 structures, including all of the popular Berkeley Tuolumne Family Camp, an institution founded in 1922. "I'm just so sad on so many levels," Janice Lin of Berkeley told NBCBayArea.com. Lin had been going to the camp with her children for years. Outside Yosemite, Lewis Paden, 80, returned Monday to the site where his father had built a family cabin — all of it now gone. "We're going to do our best to rebuild it back for the grandkids and great-grandkids to enjoy it," Paden said. As firefighters continue to battle the blaze near Yosemite National Park, the town of Tuolumne City lies within striking distance, but some citizens are refusing to leave their homes. NBC's Tom Costello reports. More than 12 helicopters and a half-dozen fixed-wing tankers were dropping water and retardant from the air Sunday. Gov. Jerry Brown declared a state of emergency Friday for San Francisco, saying the fire had damaged the electrical infrastructure serving the city and forced the Public Utilities Commission to shut down power lines. President Barack Obama called Brown on Sunday for an update and expressed his "gratitude for the brave men and women working tirelessly to combat this devastating fire," the White House said. At close to 280 square miles, the blaze is more than four times the size of San Francisco. The fire was sparked last week in a remote canyon of Stanislaus National Forest, with arid conditions feeding the flames. NBCLosAngeles.com reported that the Rim Fire is one of seven that has burned more than 10,000 acres this summer alone. Statewide, nearly 9,000 firefighters are battling nearly 400 square miles of fires. NBC News' Daniel Arkin, Henry Austin, Elizabeth Chuck and Jeff Black, Reuters and The Associated Press contributed to this report.